"Rollicking Realm of Boreas: A Century of Carnivals in St. Paul," by Jean E. Spraker. In Minnesota History, vol. 49, no. 8 (winter 1985), pp. 322-331. "Chilling Tales: A History of the St. Paul Winter Carnival Ice Palaces," by Mary Jean Jecklin. In Architecture Minnesota , vol. 18, no. 1 (January/February 1992), pp. 20-23. “Come to the Carnival at Old St. Paul”: Souvenirs from a Civic Ritual, interpreted by Jean Spraker. Prospects, NY: Prospects Vol. 11 (1987), pp. 233-246. Winter Carnival: St. Paul’s Annual Snowfest, by K.M. Kostyal. In National Geographic Traveler vol. 1, no. 4 (Winter 1984/85), pp: 52-64. Fire & Ice: The History of the Saint Paul Winter Carnival, by Moira F. Harris. St. Paul, Minn.: Pogo Press, 2003. 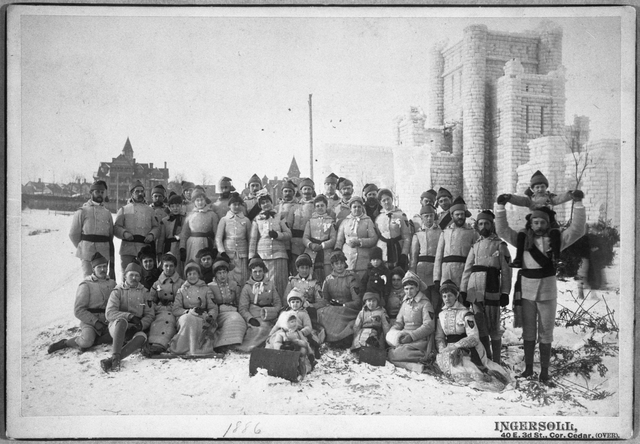 St. Paul Winter Carnival: 100th Anniversary History, 1886-1986, by Judith Yates Borger. St. Paul, Minn.: Jan Wiggs, 1986. Pioneer Press Treasure Hunt History, by Jesse D. Anibas. White Bear Lake, MN: Treasure Hunt Headquarters, 2005. Afton, Minn. : Afton Historical Society Press, 1998.